ASCO Automatic transfer switches are the best quality money can buy. ASCO (Automatic Switch Company) invented the Automatic Transfer Switch and has been providing emergency power solutions for more than 110 years. ASCO is the largest manufacturer of Automatic Transfer Switches in the world and holds approximately 50% of the world market in switch installations. ASCO holds more transfer switch patents than the rest of the industry combined. 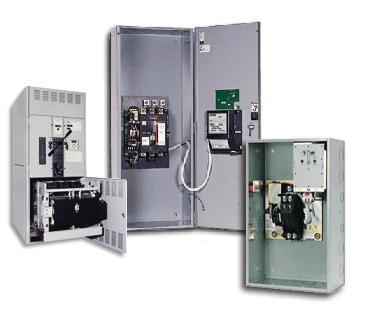 Every ASCO transfer switch is certified by Underwriters Laboratories as meeting the UL-1008 standard for Automatic Transfer Switches, and the label is right on the front panel. If you don't see the UL Automatic Transfer Switch label ... you're not getting the best protection money can buy. We sell several types and models of transfer switches So no matter what your application, from residential and small business to industrial, we have the automatic transfer switch you need to get the job done. The ASCO series 300G automatic transfer switch offers options and features that support industrial customers needs for power control, measurement, and communications. The ASCO series 185 automatic transfer switch is designed for the residential and small business application. It is a very reliable, easy to install and use switch, and has the features that homes and small businesses need to start and run their backup generators. If you're looking for a residential or industrial manual transfer switch, we can supply you wither either the series 185, or the series 300G manual transfer switch.